It's been a week since the mass shooting in Vegas. 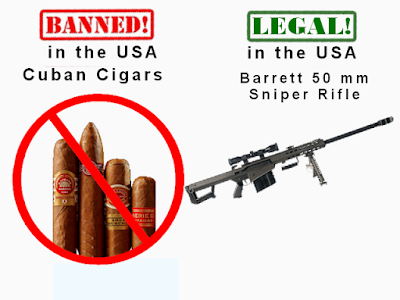 I've been hearing the usual arguments about gun control, preserving the 2nd amendment right to own guns versus the mass shootings that happen almost daily. 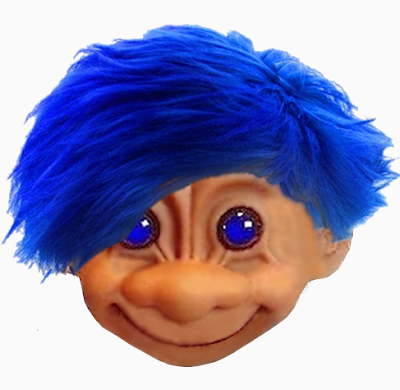 The outrage over the shootings seems to be dying down already. With the Vegas shootings, America was up to 272 mass shootings in 276 days. Out of those 272 incidents, 152 of them had at least one fatality. Those are completely insane statistics but they mirror the proliferation of guns in America. There most certainly is a correlation between the number of guns owned and the number of mass shootings yet nothing has been done to correct the problem. 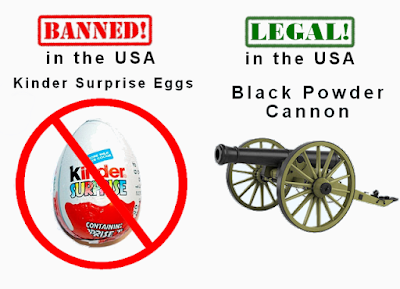 On social media, Kinder Surprise Eggs made an appearance as an example of America's bafflingly inconsistent policies for banning things. 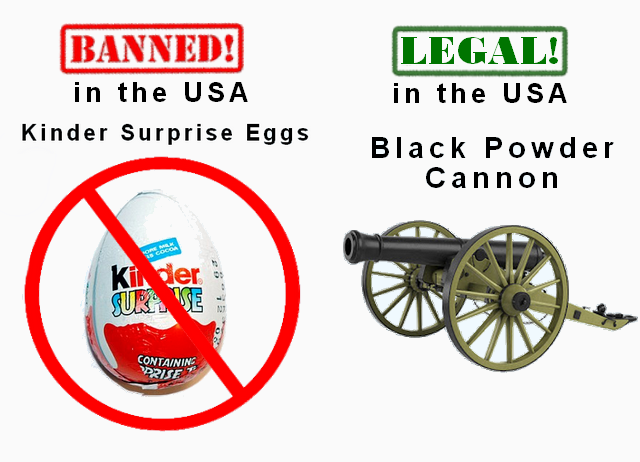 Because of the ban, it's no surprise few Americans knew Kinder Surprise Eggs are an edible chocolate shell surrounding a little toy. Though it really isn't remotely possible, the eggs are banned in the US because someone thought they could be a choking hazard. 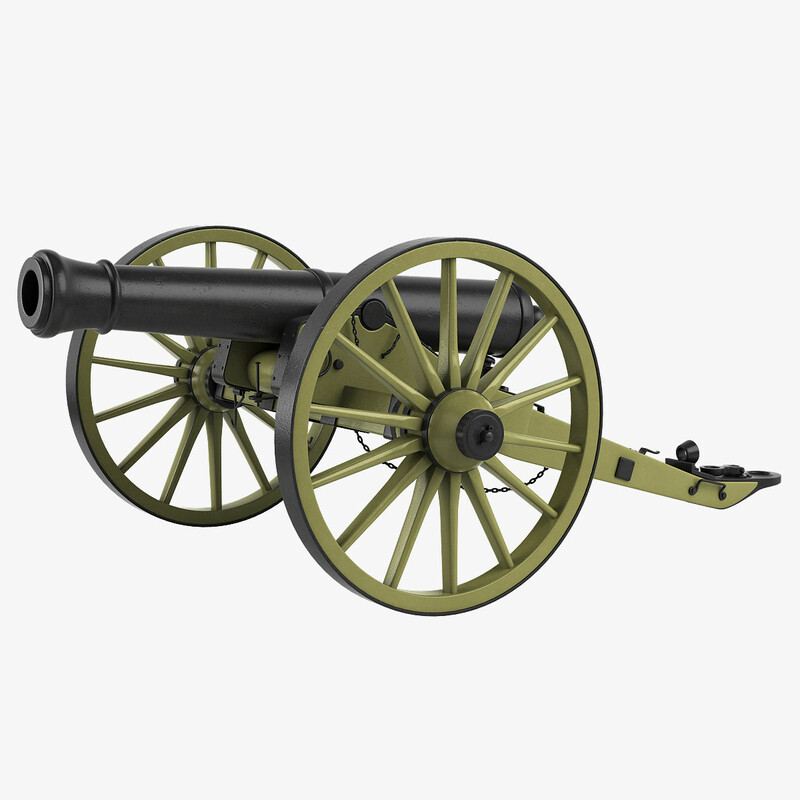 However black powder cannons can be legally purchased and owned in the United States. 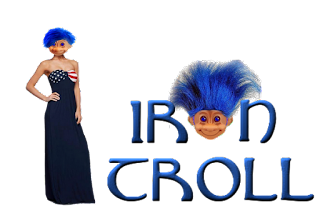 Because you cannot choke on a cannon. I decided it might be interesting to see what other strangely inconsistent items are banned in America. 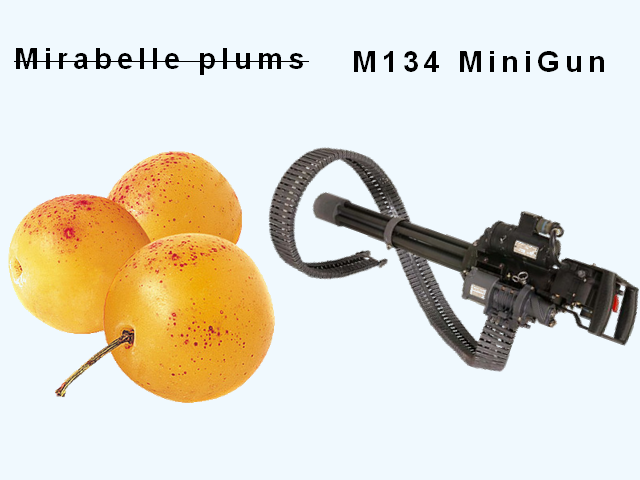 For some secret reason we aren't allowed to have Mirabelle Plums in the US but we can own a MiniGun which fires up to 6,000 rounds per minute. That's 100 per second. 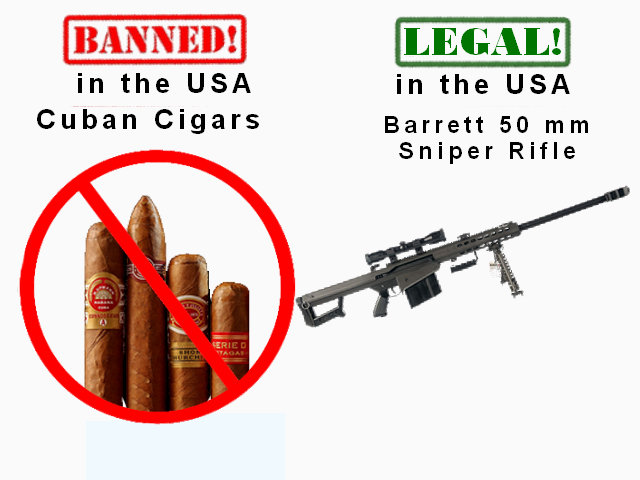 Cuban cigars can't be sold in the US but you can buy a Barret 50 mm sniper rifle. It's the perfect rifle for duck hunting! Get yourself some armor piercing, incendiary ammunition and you can blow those mallards out of the air and cook them at the same time! Irish citizen and activist, Bernadette Devlin McAliskey, is a former member of parliament and has been a civil rights leader for decades. During her career she's made frequent visits to the United States and was awarded the Keys to the City of both New York and San Francisco. In 2003, at the age of 56, McAliskey was was banned from the US. The only reason given was that she posed a "serious threat to the security of the United States". At the age of 70, she's still banned. 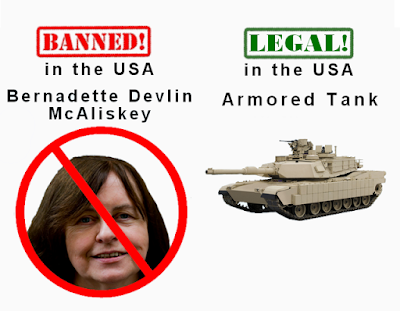 Irish senior citizens are dangerous to America so it's fortunate any citizen with the money can buy an armored tank for protection. 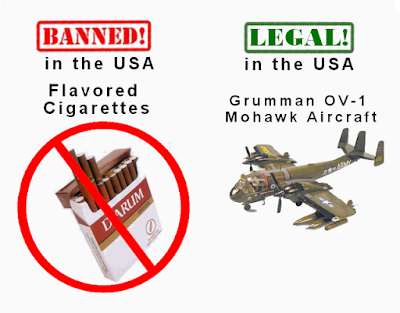 It's illegal to sell flavored cigarettes, like those stinky clove cigarettes, in America. 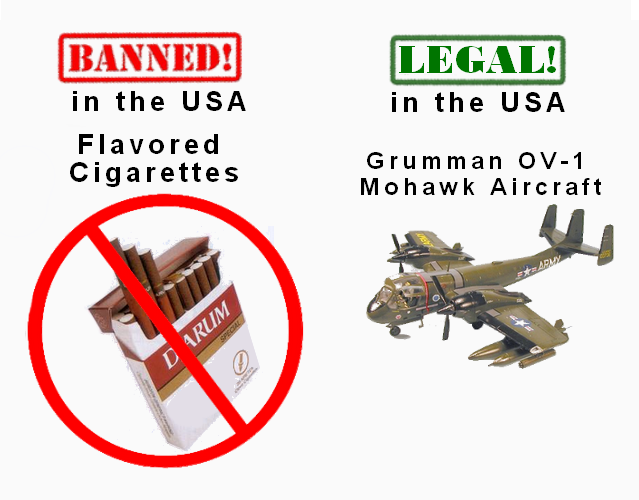 You can put the money you save from not smoking towards the purchase of your very own Mohawk aircraft. Tanbou are Haitian drums that use goat hide for the drum head. Tanbou aren't legal in the US because there's a slight possibility of catching anthrax. Because it happened once...43 years ago. Fortunately you can't get anthrax from bullets so semi-automatic weapons are totally okay to purchase. 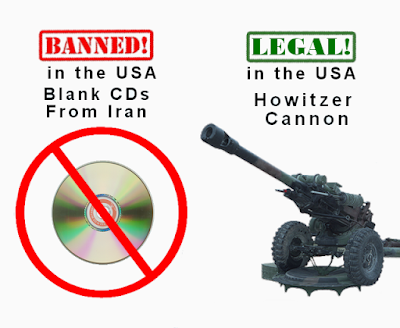 I can't even guess why, but blank CDs from Iran are prohibited from being sold in the US. Buy yourself a Howitzer cannon instead. Ivory is banned from being imported or sold in the US to discourage the poaching elephants and other tusked animals. 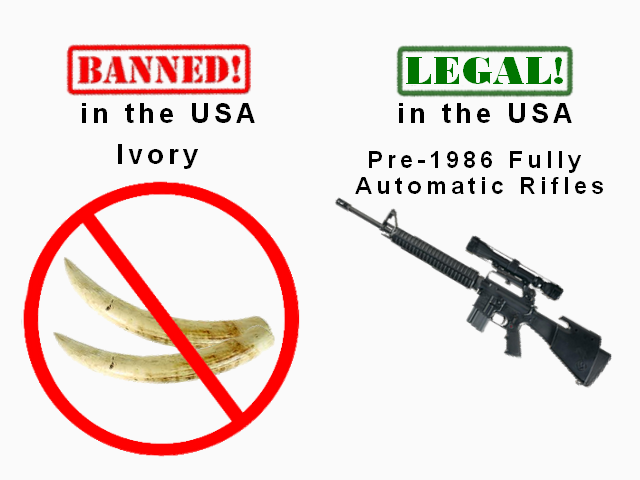 However antique ivory, over a 100 years old, is totally okay to own. 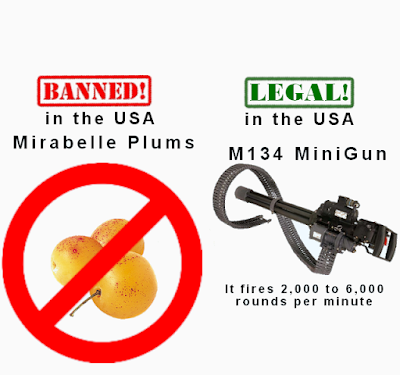 That's similar to fully automatic rifles. 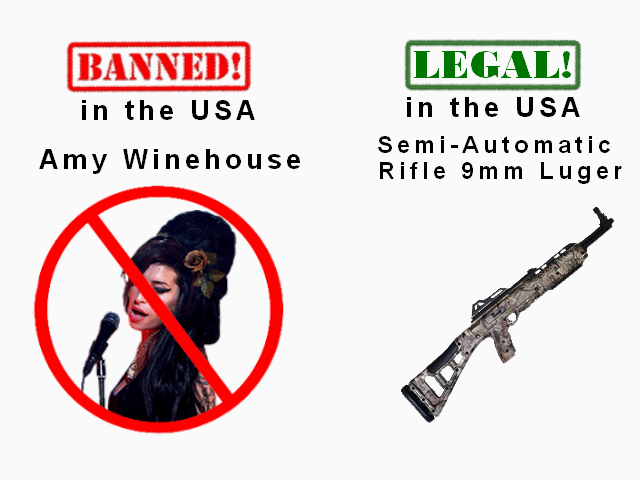 Automatic rifles aka machine guns are banned in the US unless they were manufactured before 1986. So that means there are at least 150,000 machine guns available in the US for purchase. Thirty years old but FULLY automatic. 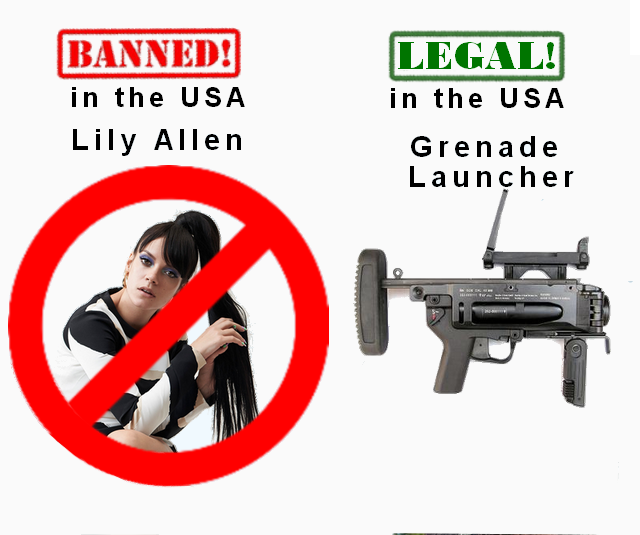 Singer Lily Allen is banned from entering the country for kicking a photographer who was pointing a camera up her skirt. She should have hit him with a grenade laucher. Those are legal to own. 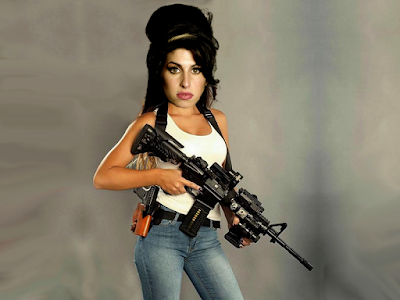 Another musician, Pete Doherty, is banned due to his overindulgence in illegal chemicals. In the US it's legal to purchase the chemicals to make Tannerite. If you mix the 2 chemicals together and then shoot the mixture with a rifle or shotgun, you'll get a nice explosion. 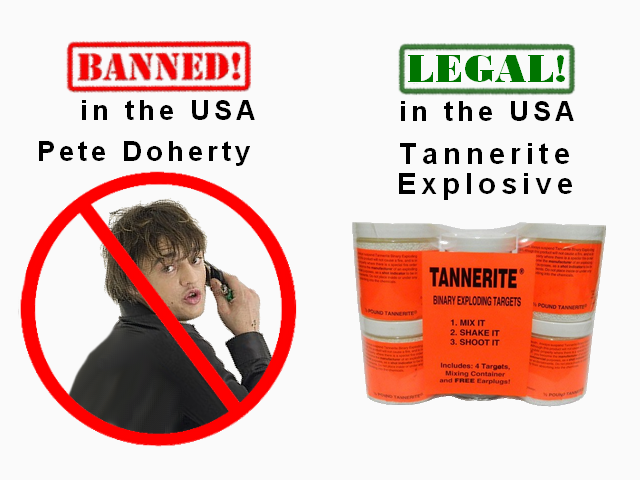 The Vegas shooter had 50 pounds of Tannerite. 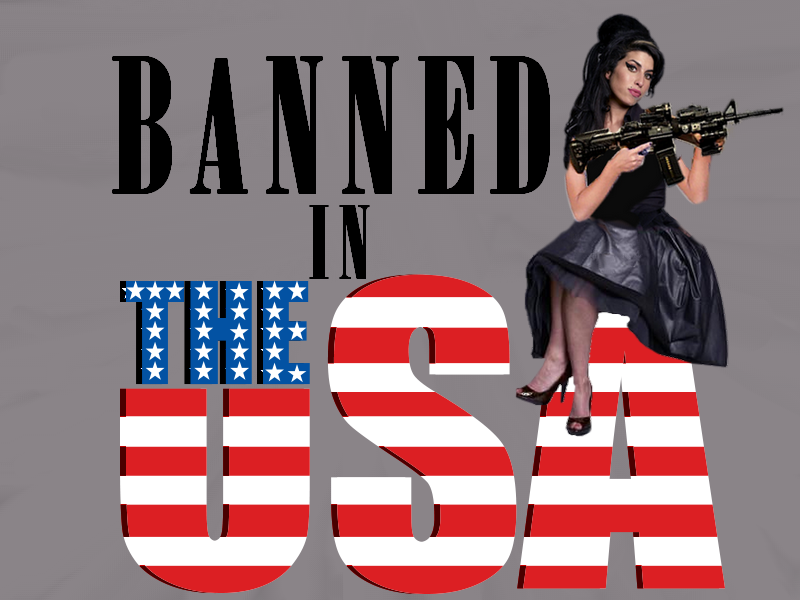 Before she passed away in 2011, Amy Winehouse was banned from the US because the American government frowns on celebrities who assault someone. 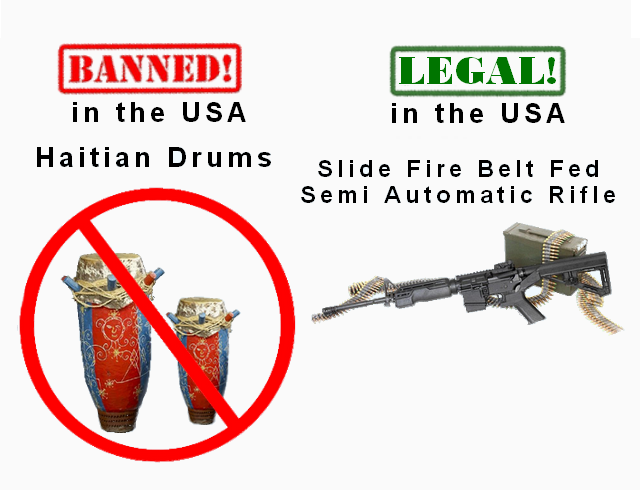 But owning an assault rifle is totally okay. Did you know that children's book printed before 1985 are banned? It's because the ink used in their production may contain lead. Lead is a health hazard, particularly for children. Apparently the lead from a semi-automatic rifle using a legal bump stock so it can fire like a fully automatic rifle isn't hazardous enough to get congress to ban bump stocks. Someday perhaps we'll see sensible gun control laws passed in order to protect citizens while still preserving their right to bear arms. 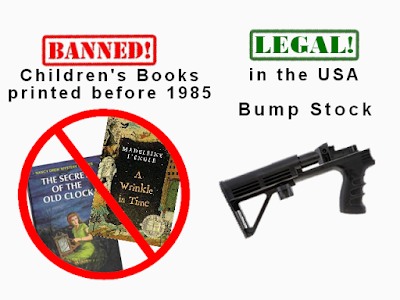 But considering Sandy Hook and Vegas weren't enough to get Congress to act, I'm not holding my breath.